Dominance is an integral aspect of strategy. Strategy, whether in war, sports or business, is about how one can place themselves in a competitive position that gives them an advantage over competitors. If that position can be made so overwhelming by one competitor that others are effectively taken out of effective competition, that competitor is dominant. Dominance wins. The game is over. Everyone else is playing for second place or lower.Creating Dominance describes how successful law firms have gone about dominating their marketplaces - be they a practice area, a city or an industry. 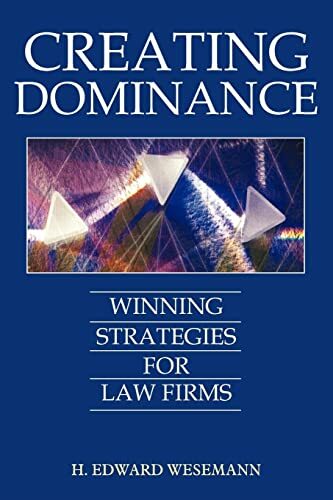 The book begins by describing the characteristics that identify a dominant firm and the precise strategies law firms can use to put themselves in a position of dominance.